Aren’t rabbits just the cutest? My kids once had a rabbit. She was a black and white Netherland Dwarf, but didn’t turn out quite so dwarf as I expected, as it turned out. She was very tiny when we first got her but she grew to be quite huge! It was my oldest son who pushed for her. He was always wanting new animals. Over time, we had a menagerie of them in the house. I would have stuck to cats and dogs inside and at least horses outside, but my oldest son wanted every animal imaginable as his indoor pets. I drew the line at rats, but we did have a snake once. Come to think of it, as a still teen, I caught and kept a tarantula for a while. Shudder, now. Way back then, I thought it was cool. Back to rabbits. Aren’t they just so darn cute? This is a perfect sketch for an Easter card I’m making. I want to print it and use it on two cards for granddaughts. I know it is likely copyrighted and I’ll be glad to pay if you tell me what I owe you. Thanks for that compliment! How could I possibly say no to you gifting your granddaughters like that? 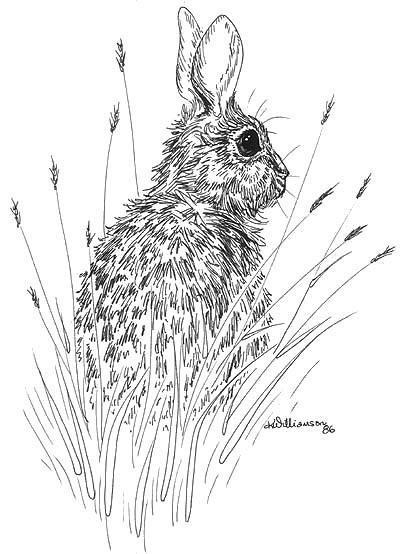 As one grandmother to another, feel free to print out and use this rabbit ink sketch free a couple of times, with my compliments. Happy Easter to you and yours!